Over the last 35 years TODEC has assisted over 100,000 Inland Empire residents with “TODEC’s Citizenship Program #NaturalizeIE Campaign”. TODEC’s #NaturalizeIE Campaign goal is to reach the 250,000 Inland Empire residents that are eligible to become Naturalized US Citizens. TODEC’s campaign assists eligible Legal Permanent Residents with their Legal Pathway to Citizenship via Naturalization. 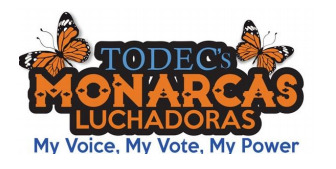 TODEC’s "Monarcas Luchadoras Youth Leadership Program"
TODEC’s Campaign has different ways that we youth can get activated, with our VOICE, with our VOTE, and in return we will activate OUR POWER! Monarcas Luchadoras which translates to Monarch butterflies in the Struggle for justice, dignity, and equality. Alike the monarch butterflies many of our youth and their families have migrated to the United State to advance their wellbeing.